From the kitchen of One Perfect Bite...I spend a few days each year working with a group of women who develop recipes for low-income families. Our goal is to develop nutritious meals that have wide appeal. These recipes must use inexpensive ingredients but still deliver meals that are flavorful, wholesome and delicious. This slow cooker meal, adapted from Family Circle Magazine, is an example of the type of recipe the group experiments with. 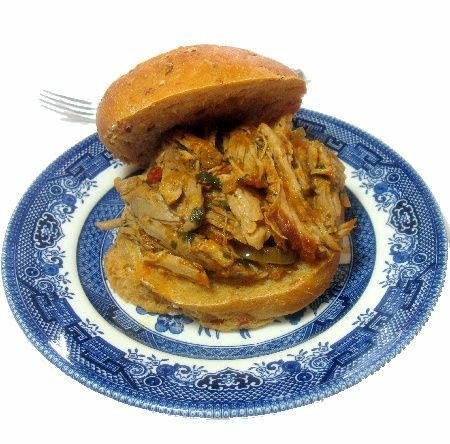 It is patterned after Lechon Asado, a slow cooked pork roast that is a signature dish of Cuban cooking. Addressing the concerns of those on limited budgets, the group opted to use a loin of pork rather than its shoulder, because the loin is less expensive here. They opted to serve the pork over rice rather than in rolls which would have added a couple of dollars to the meal. Eliminating the bread allowed them to make black beans to serve alongside the pork. They also decided to use pickle relish instead of chopped pickles. While relish is a common ingredient in their pantries, pickles are not. The original recipe was made in a crock-pot, but not all of the group owned them. As an alternative, they cooked the pork stove-top for about 3 hours. They felt that baking it in a 250 degree oven for 5 or more hours was a waste of energy, a point that is awfully hard to argue. The recipe the group came up with follows. I've highlighted the changes they made to the original recipe. This is really a great family meal. The citrus overtones of the pork play nicely against the heat of the black beans that appear below. I know you will enjoy dish. Its flavor improves with age and I'd suggest you make this a day before you plan to serve it. Here's the recipe. 1) Season pork with 1/2 teaspoon of salt and 1/4 teaspoon of pepper. Heat vegetable oil in a large skillet on medium-high heat. Brown all sides of pork, about 6 to 8 minutes. Set aside. 2) Put tomato paste, remaining 1/2 teaspoon salt and 1/4 teaspoon pepper, orange zest and juice, lime zest and juice , cumin, oregano and broth into liner of slow cooker and stir to combine. Add onions, garlic and pickle relish. Place browned pork on top. Cover and cook on HIGH for 1 hour. Reduce heat to LOW and cook for 4 to 5 hours longer. Remove meat from slow cooker and using 2 forks pull it into shreds. Return to slow cooker and heat through. 3) Stir in cilantro. 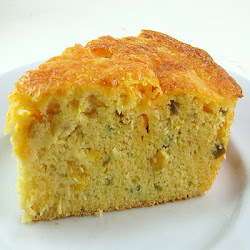 Serve with rice or on ciabatta or Cuban rolls. Yield: 8 servings. 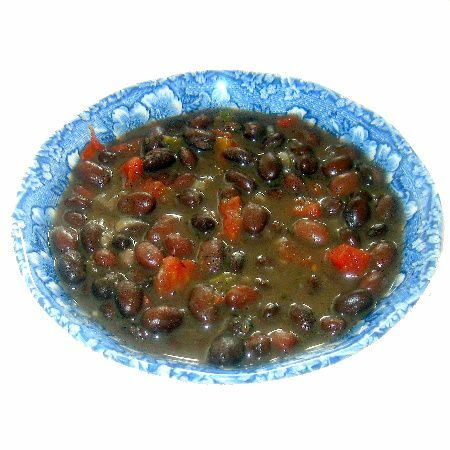 This is the quick and easy recipe that was developed for black beans. It uses canned beans, so the dish comes together very quickly. The beans are delicious. Heat olive oil in a medium-size pot. Add onions and sauté until soft. Add oregano and cumin and stir, then add can of diced tomatoes with green chilies. 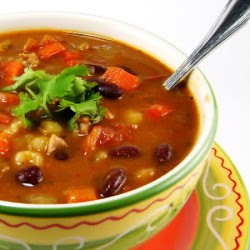 Add 2 cans of undrained beans and bring to a simmer. Cook on low heat for 20 minutes, Drain reserved can of beans and add to pot. Cook 10 minutes longer. Serve hot. Yield: 8 to 10 servings. The men of my house would love this. I will have to bookmark it and make it for them sometime. P.S. I have always loved your header on the blog. Looks absolutely mouthwatering. Will have to give it a try. Your effort on behalf of low-income families just one more thing to admire about you. My first thought (not owning a slow cooker) was to use the oven, but I will try the stovetop to save money. Thankyou, Mary. What a wonderful benefit your group brings to low-income families. I think most people think to save money you have to skimp and eat junky type foods. This just proves you don't have to have a lot to make an amazing meal! I really like this kind of meal. Very tasty plus, it's budget friendly! That sounds like a great way to use your talents to give back to the community. We just had a Cuban sandwich and black beans over rice at the local authentic Cuban place in Maryville and I've been wanting to try it at home, so thanks for posting this. This is such a worthwhile cause. Poverty and poor nutrition do not have to be linked. Thank you for what you are doing. This dish sounds so good. Wow I love what you guys do! and the meal looks scrumptious!! Hats off to you, Mary, for doing a very noble cause. As always, your food looks delicious. What a great cause you volunteer for. I never knew that such a group existed and it's a great thing your doing. You should put a cookbook together with these recipes so it's accessible to low-income families across the united states. I think most people would love to create something delicious for their families if they knew how. Hmmm - both look so hearty and incredibly flavorful and delicious of course. I love this!! I loved reading about the thought that went into making this recipe. Even though I am not low-income, I'm not rich either, and every little bit helps! Looking forward to trying the crockpot Cuban pork recipe! Oh those black beans look good and it's put me right in the mood for beans tonight. you are doing a noble task. i wish i could do the same thing over here in STL. do you know of any group of women who does that here too? this crock pot cuban pork and black beans will definitely fill the house with a heavenly aroma... and im sure every member of my family would love. This looks soo good!! I've been thinking about Game Day food and I think you've just provided me with a fabulous idea!! I've never made Cuban Pork in a crock pot! I'm curious to try it out!! Lovely creation. We don't often experiment with Cuban flavors, so this will be a nice one for us to try. Thank you for sharing it. Just lovely. The sandwich looks juicy and wonderful!!! What a fabulous dinner - I really think I'm going to have to make this for my family - they'll love me for it!! The slow-cooked pork with the black beans sounds wonderful, Mary! What a worthy cause to help low-income families eat nutritiously. Is there anything you DON'T do?!?!? But seriously, that's awesome! And so is this dish! Flavorful and delicious looking dish! I love pork and this looks mouthwatering! Thanks, Mary! Heheh, love how your one and two-year ago posts are posole and skillet cornbread. Quite a Latin spread you have in this post. This is big here in Tampa!!!!! Love it! Mary - I love to hear about the organization you are part of. It's definitely from the teach a man to fish philosophy and I love that. This is a perfect recipe because it can be stretched a long way and the beans are extremely nutritious. Aside from that though, this dish sounds wonderful and one I would definitely make myself!